Tested, trusted and recommended by dog trainers; a portion of our profits go back to the dogs and cats we love through donations to The Humane Society. NOW WITH LOUDER BELLS! 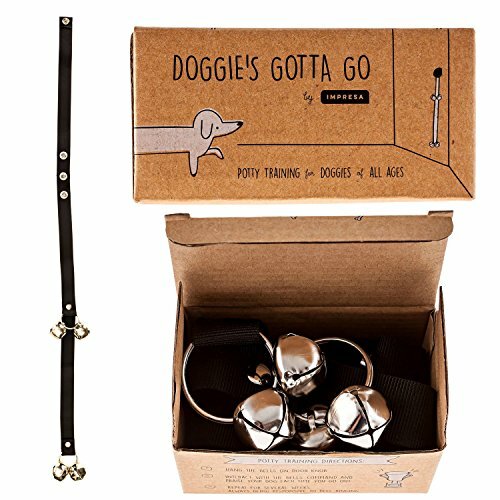 With our Doggie’s Gotta Go dog doorbell, housetraining your puppy or grown dog has never been easier. No matter the age or breed of your pooch, you’ll find our training device easy to use and our system easy to follow. So how does it work? STEP 1: Hang the bells on the door you use to take your dog out. You can also hang them on a hook next to the door (a suitable hook can be found at any hardware store). STEP 2: Whenever you take your dog out, allow the dog to move or otherwise interact with the bells. When he/she does so, ring the bells and state a command associated with going outside. Provide positive verbal feedback and take your dog out. STEP 3: Repeat the process, always giving the same command and praise. Make sure that you don’t distract your dog from going to the bathroom by playing after you take him/her outside. If you’re going outside to play, don’t use the bells. After a few weeks of this routine, most dogs will begin ringing the bells on their own. When they do so, it is VERY IMPORTANT to take them out right away to reinforce the conditioning. Manufacturer’s warranty guarantees product for life. Not happy? Simply let Impresa Products know, and we’ll make it right.